THIS EVENT IS SOLD OUT! THANK YOU FOR YOUR INTEREST AND SUPPORT! Where: IF YOU HAVE A RESERVATION AND DID NOT RECEIVE AN EMAIL WITH THE MEETING PLACE, PLEASE CONTACT THE HSRC OFFICE AT (845) 634-9629! Please note: For this three-part tour of North Rockland, guests will travel from place to place in their own cars. We will provide the driving directions and meeting locations with your confirmed reservation. On September 22, 1780, General Benedict Arnold and Major John Andre men met along the Hudson shoreline. 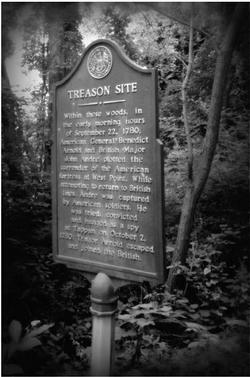 Their act of treason was a pivotal point in the Revolutionary War. Guests will learn the details of this important historical event by visiting three of the places that were involved. Join us as we retrace the steps of Arnold and Andre in North Rockland. After the walk, guests may join us for an optional lunch at Babe's restaurant in West Haverstraw.